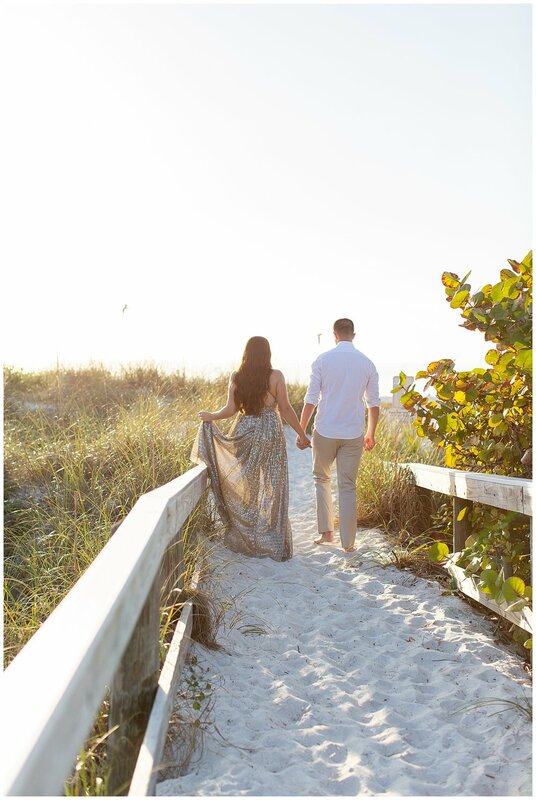 When Carla and I made our flight arrangements to visit our best friend Nicole in Florida, the first thing I said I wanted to do while there was a quick engagement session with her and her husband one evening. My favorite people to photograph are the people I know and love and being able to share images with them, of them, in which they look and feel beautiful is the most fulfilling part of my role as a photographer. I believe everyone deserves to feel their best in their photos. That I have the privilege of stopping time and preserving a memory, a season of life, that future generations will look back on is the ultimate gift to me. Even when family or friends are a little hesitant to take the time (usually the guys, it’s ok guys! ), I always encourage them to give me just a few minutes to snap some pictures because I know they will look back and believe that having those images was worth it. 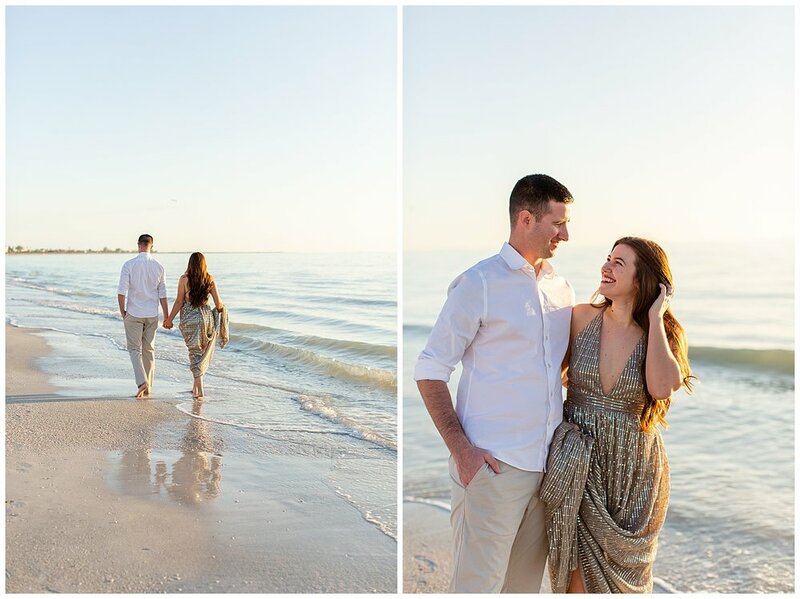 It didn’t take much deliberation to decide to go full-on and make their quick session more formal. That dress!! And what I love most is that it reflects the gorgeous woman she is inside. Nicole and I met on our first day of high school. Our lockers were two apart from each other all four years (Stottlemyer and Stubbs, at the time) and we used to joke about asking the girl between us to switch :) A few weeks into school she offered to host that awkward pre-Homecoming dinner at her house and for the girls to sleep over after the dance. My homecoming date may have kissed someone else that night, but overall it was a success because from that sleepover on Nic and I were fast friends. Since then we have been through a lot together. The field trips, the softball team, the boys, the college visits, the jobs, the trips, and the boys that became our husbands (it makes me happy to think we’d still have lockers near eachother now as Barton and Belson). But nothing we’ve ever been through together will compare to when my brother died and she booked a ticket before I’d even had a chance to talk to her. Apparently she tried to jump in her car when Patrick texted her to drive all the way here from Florida, but her husband convinced her to get a plane ticket. For the two weeks she spent with me and my family, she joked that she was our “emotional support pet” and her purpose was to just be here in any capacity we needed. She and Carla’s boyfriend Max spent numerous days at the kitchen island on their laptops working from home silently because no one knew what to say, but they couldn’t leave us alone. I’ll never forget my Mom, with tears in her eyes, looking up at them from the couch and then turning to me next to her and whispering, “I like having them here.” For giving her and us that comfort, I will never be able to repay them. In the midst of a tragedy, there are the people who you’d think would come running and don’t, the people you would never expect to be there and are, and the people you expect to support you, but completely exceed anything you could imagine with their loving and supportive actions. Nicole’s gesture those weeks is something I’ll never forget. So, yes, it wasn’t hard to have her wear something for this shoot that reflects just a fraction of the beauty within.